Some weeks have it all, don’t they? Highs, lows, too much of this, not enough of that, fresh & new, old & tired (oh wait, that’s me ;). Still working on “The Princess”. After lots of hours spent cutting and fusing I’m getting close to the actual stitching part.The process is sometimes frustratingly slow and then randomly enchanting as pieces fall into place and I see this child coming to life in fabric. I’ve been surprised to find that the developing portrait is not exactly the one I envisioned – she really does have a story to tell and I’m learning it as I go. Insomnia… yep, all week and it’s nearly 1:00am as I write this. Arrgh! A new adventure in quilting! 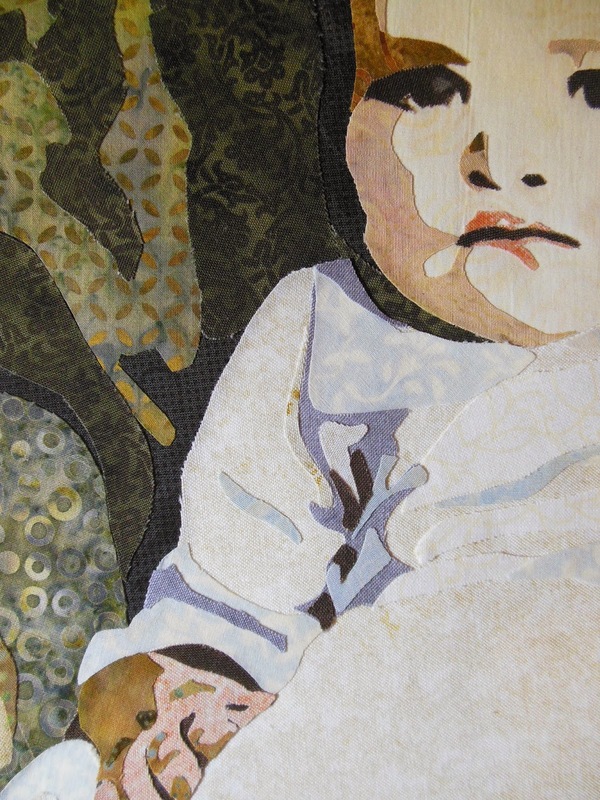 The Grove Gallery in East Lansing has expressed interest in hanging a show of our challenge group’s quilts. It would be quite a way in the future as they are booked through 2015, but that gives Brenda, Candy and I lots of time for more challenges… and with the possibility of showing other individual quilts as well, it brings a whole new sense of purpose to our creative process.